Please welcome today's guest author Regan Black! 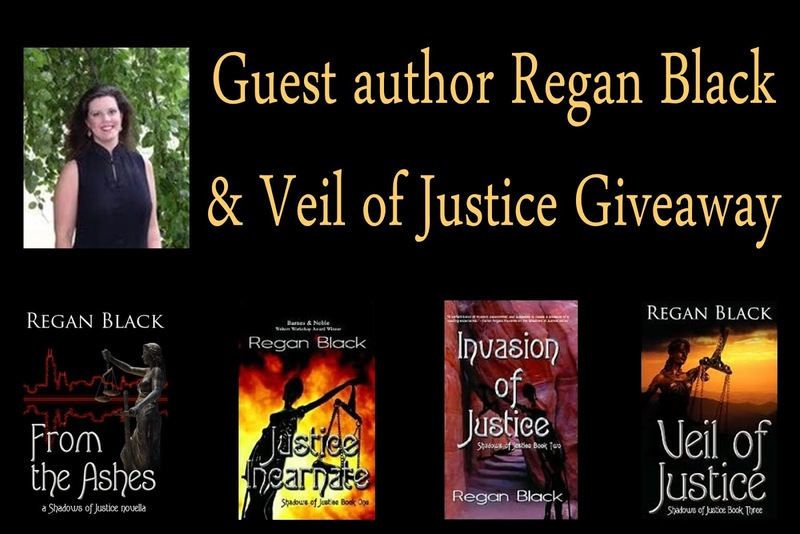 Regan is the author of The Pixie Chicks , Famous Last Words, and the Shadows of Justice series, which includes Justice Incarnate , Invasion of Justice , From the Ashes, and her new release Veil of Justice . Regan: While packing for a cross country move about 12 years ago I discovered I've been writing most of my life. Short stories and poems mostly. I come by it naturally as my grandmother was a wonderful writer and I treasure her collection of plays and memoirs. But it wasn't until we moved to South Carolina that I discovered I could write an entire novel. My husband's office was being remodeled and he worked at home for several months. In an effort to remember why I fell in love with him I wrote the world's worst romance novel, and I've continued to write romance novels ever since. Regan: I love reading paranormal stories, they just have that something extra that makes reading for pleasure and escape so much more fun. When I got involved with my first writer's group the feedback on my romantic suspense was "Where's the paranormal?" Apparently my writing voice naturally has that 'paranormal feel'. Once I embraced that, my writing really took off. Regan: Oh, so many options so little time! At the moment, maybe just because it's nearly the end of summer as I write this, I'd like the power to be invisible. Not only to avoid my kids asking about dinner, so I could hide and keep writing, but think of the things I could observe and the places I could sneak into. 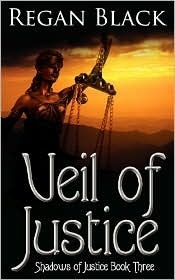 Regan: Readers will enjoy Veil of Justice, the third book in the series, because it resolves Nathan's dilemma (he's been undercover and trapped in solitary confinement) and it brings the shadows of justice characters through yet another challenging adventure with plenty of romance for a wonderful reading escape. Regan: Oh, doesn't every author dream of a book making it on the big screen? And we have to have someone in our mind's eye as we craft the tale we want readers to enjoy. I guess when I wrote the first book, Jaden's physical build and skills were modeled after Lara Croft, so I'd love to see Angelina Jolie as Jaden, the heroine of Justice Incarnate. But for Veil of Justice, the romantic leads I see are Scarlett Johansson as Kelly because of how well she played her character in Iron Man 2 and Chris O'Donnell as Nathan, because he can pull off that dangerous edge under the boy next door thing. 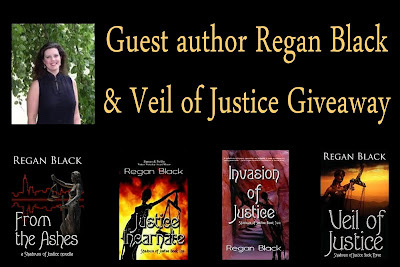 Veil of Justice (Shadows of Justice, book 3) by Regan Black. An undercover operative, a guardian of ancient secrets, and an impatient goddess collide for a thrilling ride as the Shadows of Justice saga continues! When Nathan Burkhardt agreed to the undercover assignment, it was all about justice and retribution for the soldiers impaired and imprisoned by a dangerous geneticist with a God-complex. But when he lands in solitary confinment, his only salvation is his telepathic connection with a mysterious woman working for his sister. Denied her place in the family 'business', Kelly has changed her name and redefined her purpose in life - until tragedy strikes - leaving her the only one left to preserve the family's priceless secret. Thank you Regan for joining us here today at From the Shadows! To learn more about Regan Black and her books please visit her website. To enter, please leave a comment with your email address. You do not have to be a follower to enter (though I always appreciate a follow!). This giveaway is international! Giveaway ends Friday September 24th midnight EST. Thanks for the contest! I would love to enter. I would love to have the books. I haven't read any of the series and it sounds really good. Thanks you for opening it to International entries. Good Morning, E.J.! Thanks for having me today! Wonderful interview, and can't wait to finish reading this series. Thanks for stopping by. I'm so glad you like the series. An interesting interview. Thanks, this is an exellent site! Thanks for visiting, Secret Writer! E.J. always has great stuff going on here. Thanks for sharing. Your books sound really good. your a ne wto me author awesome interview and contest! A new to me author - love finding them. I would love to be entered to win. Always in the market for a new book. Very nice contest. Thank you. I am a new follower. Count me in. Her books sound very interesting. I like the interview and I would love a chance to read this book it sounds great! Nice interview. I'd love to win the book. I'd love to enter the giveaway please! This series sounds pretty good; I look forward in reading it. Thanks for the giveaway! I would love to enter. These sound like books that my daughter would totally enjoy! (I, of course, would guiltily sneak off to the side and read them too! LOL!) Thanks for the chance to win .. awesome giveaway! Great giveaway :) Please enter me! I needed a tip for a good book thanks! These books sound right up my alley. A new author to add to my list. Love discovering new authors. Please enter me! I love books like this. Please enter me too! Sounds terrific - count me in please! Looks great - please enter me!! I'd love to win Regan's Book. I would be great to read a book of someone I read everyday.